by KevinFreitas on 4/18/2013 @ 7:28am My initial thought: Excited for the museum and the space is much needed on the inside for the new collection. Externally? Continue Tacoma's Brick City legacy and ditch the '70s brown ugliness. My hope is this design may have to be vetted more for it's historic context due to its location (similar to how the new hotel off 21st was. Or, if it's just outside that historic zone, we may be stuck with brown. Oh, and what of the beautiful/haunting tree next to their current sign? Please don't remove that beauty! by Jesse on 4/18/2013 @ 7:36am Can it be added on to in the future? More blank wall for Pacific Avenue? Isn't the blank wall area a good spot for micro walk-up restaurants?Outdoor seating? I thought there was going to be a significant outdoor art piece? I'm happy for the museum. An add-on is a big win for everyone. by KevinFreitas on 4/18/2013 @ 7:53am Dig your questions @Jesse, definitely curious about those myself. I'm immensely happy for TAM as well but would also ask why TAM doesn't feature some of their art more publicly to viewers outside (see: blank walls along Pacific) like the Museum of Glass does? I understand glass art can likely withstand light/weather better but get creative: Movie theater style lit, framed posters of pieces currently on display. LED wall digital art/billboard installation. Something! by Maria on 4/18/2013 @ 8:34am Kevin, I thought the same thing. My biggest concern is, I was hoping the design would create more of an active plaza space. Maybe a bit more room and a backdrop for outdoor activities, performances, people eating lunches, etc. Also, I would have liked a bit more drama in the design. Perhaps, as RR said, it's an homage to a shipping container, but the color and shape are more akin to a railroad tie embankment. The second rendering actually looks better than the first, because the white of the museum and the tall, semi-transparent cover between the two structures helps to balance it a bit. by NineInchNachos on 4/18/2013 @ 8:45am it does kinda look like a WW2 era box car. by cisserosmiley on 4/18/2013 @ 9:07am Paint the glass museum cone like a giant TeePee and house the American West collection there. by Erik on 4/18/2013 @ 10:43am Nice to see more investments in downtown Tacoma. The Haub wing has the potential to add more life and vibrancy to Tacoma. Better now to get a better design than create another dead zone and then fly in consultants from around the world in an attempt to "activate" one of Tacoma's many dead zones. Changing the glass to clear in the dining area will open up the building a bit. However, as designed, there are a lot of improvements that could be made. Overall, the current design is too insular and a detriment to street vibrancy. Here is the chance to design the building in a beneficial way to downtown rather than creating another dead area of Pacific Avenue.Pacific Avenue has been adding one dead zone or blank wall after another. If downtown Tacoma is ever going to have a vibrant downtown, the city needs to demand better urban designed buildings.The proposed design kills off much of the potential connection with the street to the detriment of pedestrians and street vibrancy. The new wing will present virtually a long blank wall facing Pacific Avenue. The dark foreboding dark colors make the area look scary. The screens in front of the windows eliminate most of the connection with the street. For pedestrians and street life and vibrancy, only designed slightly better than the Wells Fargo parking garage on Pacific Avenue. The entrance to TAM has improved slightly. The old entrance was hidden around the corner and no one could tell if the museum was open or nor. The new entrance appears to at least face and be viewable from the street. However, the entrance is small and looks like any entrance to a strip mall. The awning above does not help. The plaza in front of TAM is similar to the vacuous and dead Tollefson Plaza. A huge notable art piece like Seattle Art Museum Hammering Man would help a lot. Filling in the plaza with a building helps some. However, the designers then go to great lengths to sever the street life from the building. The Seattle Art Museum has far more open windows facing the street with lighter less foreboding colors with a more marked and grander entrance. Hopefully, the design will be vetted and modified to take into account not just the insular purpose of the museum to show art to patrons, but to also value downtown Tacoma as well. 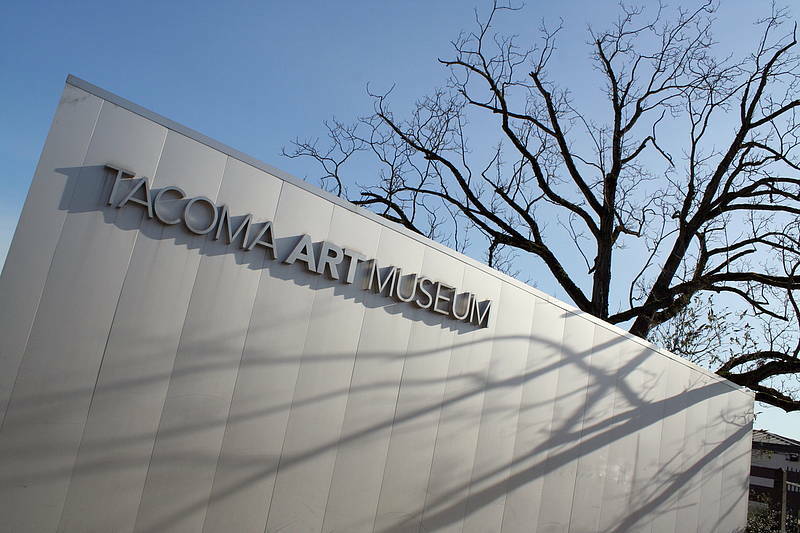 The Tacoma Art Museum design may be considered better if it were located out by itself in the exurbs. However, it is located right in the middle of downtown Tacoma on Tacoma's mainstreet and should be designed to reflect this. by NineInchNachos on 4/18/2013 @ 11:34am tinted windows make a building look cool with 'tude. like cartoon character wearing sunglasses. Local Woman Relaxing In Front Of Tacoma Art Museum. Likes American Art From The Old West, And Men. Skeptical About TAM'S New Conservative Direction.